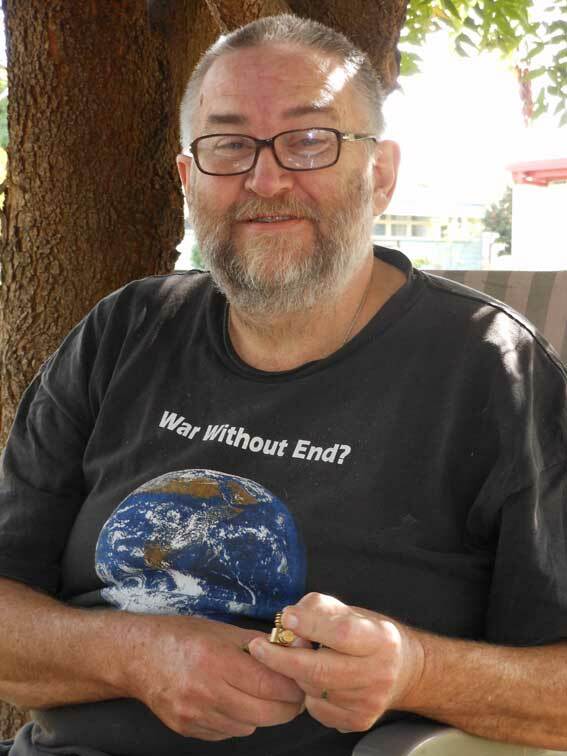 In the night of Easter Monday 2013 I learned that Bryan Law had died alone in his rented house in the flood prone, working class suburb of Depot Hill, Rockhampton, Central Queensland. 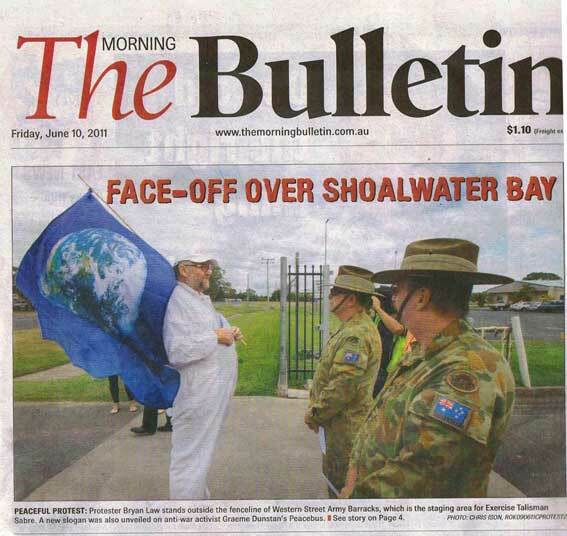 It was a small fibro shack on poles and Bryan intended it to be a base for organising resistance to the upcoming Talisman Sabre war games and for giving play to his Peace Preacher persona. Of working class origins himself, Bryan delighted in the working class ambience, proud to be amongst the poor and speaking for peace. Bryan was a man of huge spirit and courage but his body suffered acute diabetes. 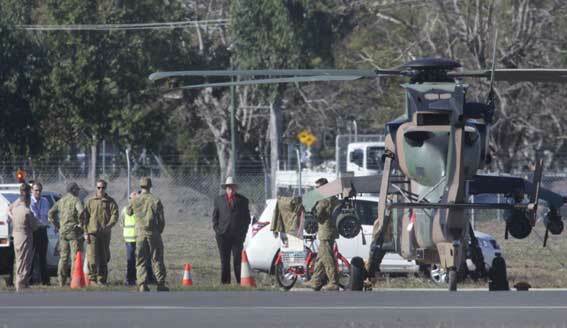 He had come from being hospitalised after bypass surgery in Cairns to Talisman Sabre 2009 and insisted on joining a trespass action into the Shoalwater Military Training Area. 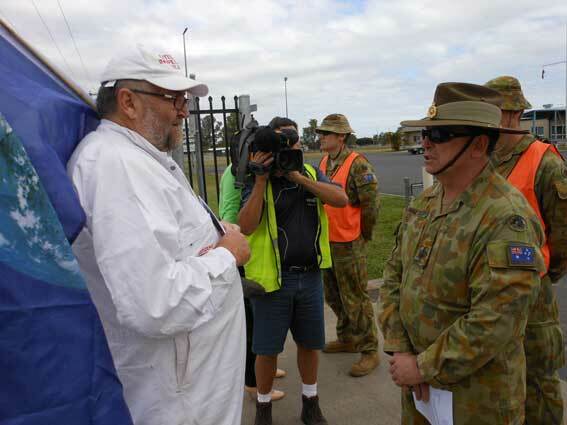 The removal of the second toe had been a direct result of his exertions disabling an Army Tiger Attack Helicopter at Talisman Sabre 2012,in 2011, a Ploughshare action which he conceived and accomplished; the first ever to be recorded and broadcast as TV news. 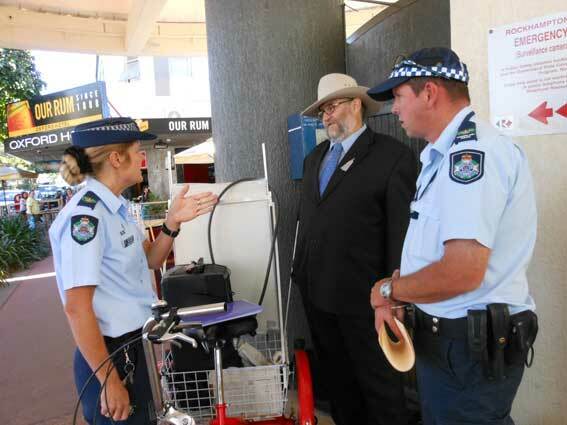 Bryan's lead up actions as the Rockhampton Peace Preacher, the big man riding a tricycle and wearing a Bob Katter hat, the drama of the helicopter strike and the subsequent court appearances made him a local hero in Rockhampton and across Central and North Queensland. Here a man who had given a toe for peace! Living alone, keeping his feet up and largely incapacitated, he worked his laptop. When the flow of emails and FaceBook posts ceased, his estranged wife, Margaret Pestorius, became concerned and notified the police who found Bryan maybe 5 days dead. His heart had failed. Police reported he was a big man to be carrying out of that tiny house. 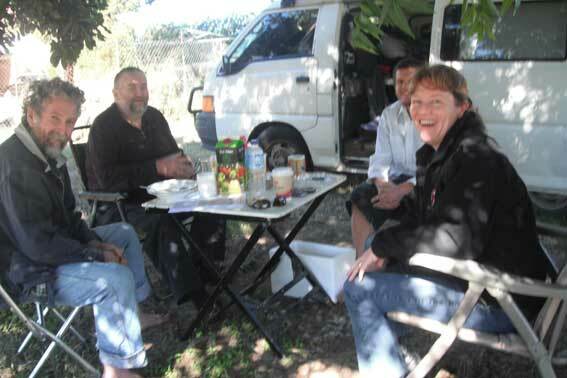 For the Ploughshare action, I had been Bryan's hire truck driver and we were due to face trial together for wilful damage and other charges in the Rockhampton District Court on 19 August. Facing time in jail together indeed. 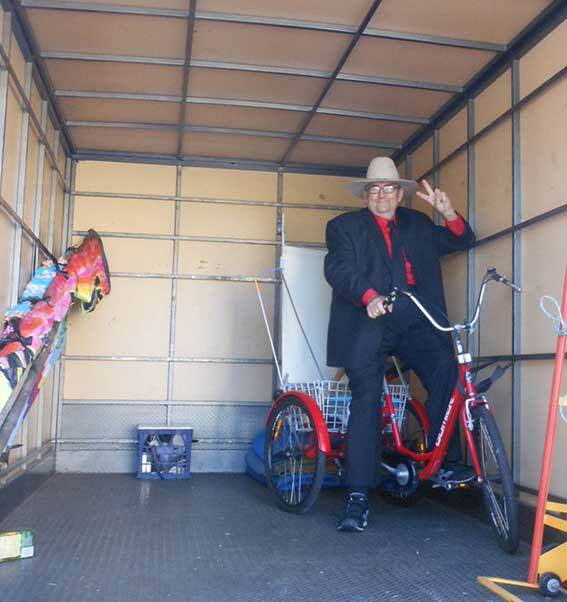 When Margaret's call came, Peacebus was camped out on the dry bed of Lake George near the Silver Wattle Quaker Centre near Canberra. Her first words were "Bryan is dead." Her second sentence was: "You will have to face the court alone." Then sobs, lots of long time sobbing. 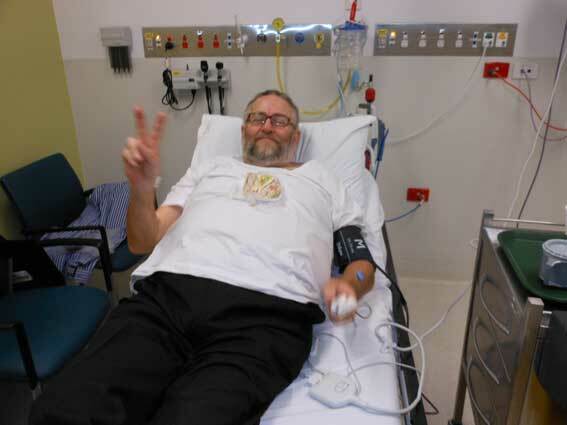 In the beginning of the night, the loss, the prospect of organising resistance to Talisman Sabre in Rockhampton and facing the court without him, had daunted me. All though the night, gloom and the grief beset me. Maybe i would plead guilty and let the matter be buried with Bryan, i thought. After all it was his gig and me just a supernumerary, a helping friend. But in the dawning light, and with a biography of Quaker founder, George Fox, in my hand, i realised that i would not be alone in the court room. To the contraryÊin that court room and before that jury, i would have Bryan's big spirit beside me and inside me. And there would be many other uplifting peacemaking friends beside. In the clear morning light, the direction of my spirit became clear. I understood that Bryan was a modern peace martyr; that he had both suffered and inspired. Easter and here was resurrection! My spirit moved from grief to joy. Christ had risen! This, i knew for certain: this is what Bryan had lived and died for and this is what he would have wanted in his death. Gloom dispersed, now joy in my heart. In that moment of that realisation, my phone rang. It was WIN Tv news camera man, Kent Murray, the same as had video-ed and broadcast the Ploughshare action, he wanting to honour Bryan and seeking a tribute statement from me. Winged and tear tinged flew the words. Full hearted i affirmed Bryan's work for peace and its auspiciousness. "Ten years of lying politicians. Ten years of bloody, futile and costly wars. And how few were they who stood in public place and spoke the truth?" i declared. "The people want peace and Bryan Law had the courage to stand tall, be visible and demand an end to the lies and an end to the wars." For this he suffered ridicule and ostracism. But he continued to give his life to peacemaking with Jesus the peace maker as his exemplar. And so it was that Bryan's faith, courage, determination, persistence and prophetic voice won him widespread respect. Now in death, body has become spirit and his example in life will inspire another generation of non violent direct action peace makers. 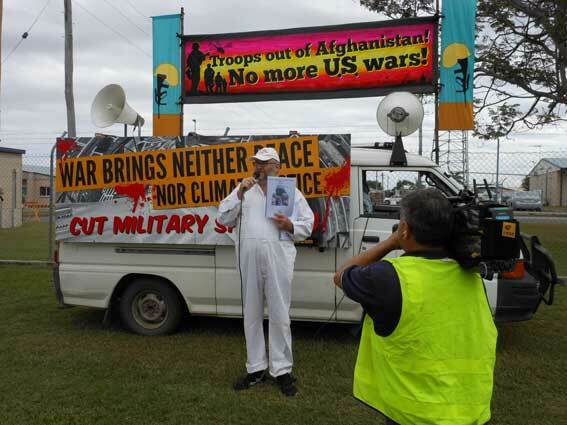 Talisman Sabre 2013 is coming up 15 July - 5 August and we who yearn for peace and justice will be using it, in this federal election year, as an opportunity to bear witness and challenge the Lib-Lab war parties for their lies and their feckless subservience to the US military alliance. 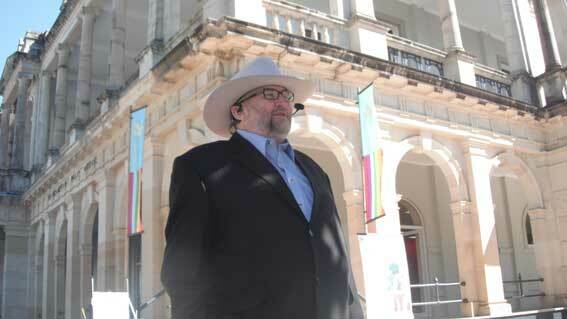 And Bryan Law's great spirit, his advocacy for non violent direct action, will be standing strong amongst us.